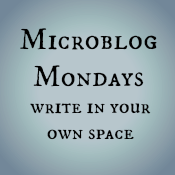 Microblog Mondays #2: The Epiphany. | Serenity Now! And so true for me also. Sometimes the best thing we can do for ourselves is get back to our roots. When we feel so thrown around by the things we go through, it’s almost impossible to remember there is so much that can nourish us! Sounds like you had a very meaningful experience this week! I have to say this kind of post mystifies me. Probably it’s just my personality, but I vastly prefer living inside my head. I mean, I take care of my body, but the best parts of my experiences come from the thoughts, memories, hopes, dreams, ideas inside my brain. If I didn’t fully focus on those, my life would be so much more empty. Sounds like a wonderful workshop! I hope you can take that epiphany with you & integrate it into your daily life. Beautiful imagery! And I imagine a wonderful new way of looking at the world! I’m trying to be in my body more and more, so this post really speaks to me. Oh my G-d. That is brilliant. I live in my head too. And it’s funny; I do yoga every morning. I should have learned this by now. And yet reading it here, it’s clear that I haven’t. Wow, love this. So true! I often feel like I’m getting carried away by anxiety and stress. Whoa. This is what I needed to read today. I’m definitely drifting, in my head, pulled this way and that. I need to be grounded. I have read your blog for years but stopped checking after you stopped writing and now I see you’ve been writing for a long time again! I’m so happy to see that. I am not able to get into it all now but I just want to say I think it’s great you’re getting into meditation. There is something that has changed my life called floating. It does the same thing mediation does but times 50 with no effort. Here’s the science if you’re interested https://www.urbanfloat.com/theories.php . I was NOT interested when I was told about it but I read dozens of articles on the science and behind it being wonderfully relaxing…I don’t believe there is a health condition (mental or physical) that can’t be greatly helped or cured by doing it (I know it’s sounds crazy but I’m telling you, I’ve read so much and it’s true). I even bought my own tank from kickstarter (finally an afforable one has been made) that I’m waiting to be delivered. Please look into it. I’m hoping to open up a float tank business if my own someday in my states that’s how much it’s changed my health and life! Oh, also EFT has helped me as well before I found out about floating (though not as much). It looks crazy and new age-y but is based on acupressure points with much science behind it as well. Youtube has great tutorials on it. I like nick ortner’s the best (he also has a documentary and book that explain the science). Anyway, I think you’re a terrific writer. Glad to see you’re back. PS I also think it would be extremely beneficial for your husband’s blood pressure.